In 1928, the people of Norka were still recovering from the devastating famine that ended in 1924. That year, Soviet leader Joseph Stalin launched his first five-year plan, which was an ambitious attempt to boost industrialization in the Soviet Union. The plan was to double steel output and triple both pig iron and tractor production within five years. The investment for industrialization was to come from the agricultural sector through collective farms (kolkhoz). The aim was to create modern 'socialist agro-towns' which would produce massively increased yields. The collectivization campaign, which began in 1929, was violent, brutal, and sudden. Overnight, small peasant holdings were merged into collectives; giant farms covering as much as 247,000 acres. Wages were abolished and a system of work points established, which were paid as a share of the collective's output. Joseph Stalin in 1943. Source: Wikimedia Commons. The peasants violently resisted collectivization through armed rebellions, and destroying crops and livestock. Stalin's response was draconian. All collective land, agricultural produce and implements were declared state property and anyone guilty of destroying or damaging them was to be shown no mercy. Peasants were forbidden to leave the countryside without permission while so called "rich" peasants (kulaks) were expelled and killed or sent to labor camps. Agricultural production fell by 40 per cent. Nevertheless, from 1931 to 1933, the forcible seizure of grain was re-introduced. The notorious "red wagons" came to each village to forcibly collect grain for the Soviet government. Through these draconian methods, the Soviet Union doubled grain exports to raise hard currency to buy equipment needed for their industrialization program. Despite the declining harvests, Stalin refused to change course, and ordered Soviet scientist Trofim Lysenko to remedy the agricultural disaster with methods based on his radical new ideas. These unproven methods led to prolonged and exacerbated the food shortages and uncounted deaths. Famine ensued. On average, the peasants were left with a third less grain than they had between 1926 and 1930. The food shortages were most acute in the Soviet Union's richest grain-growing areas, including the Ukraine and Middle Volga. 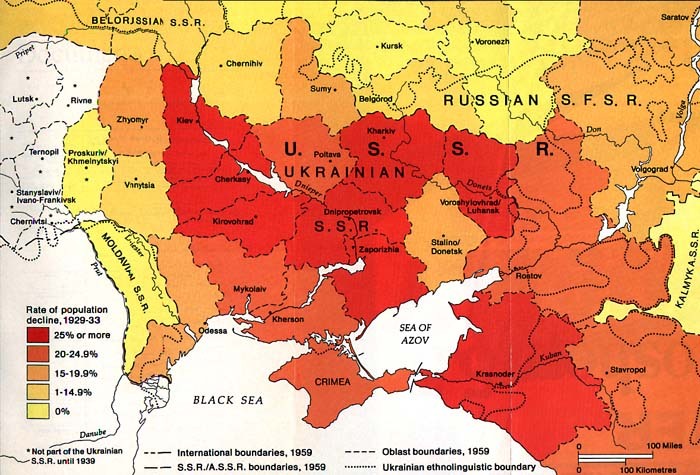 The Ukraine was particularly hard hit because Stalin initiated a campaign to crush Ukrainian nationalism and the rebellious Cossacks, who truthfully reported the existence of famine. 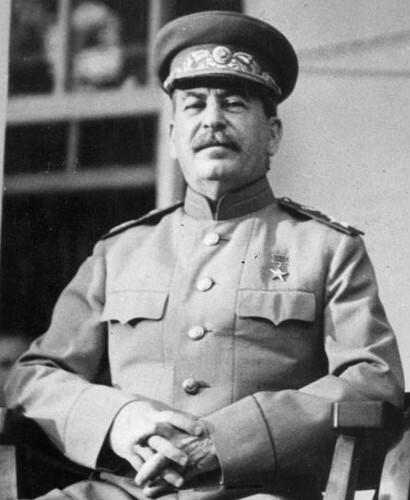 In 1931, Stalin allowed relief grain to be delivered to all regions except the Ukraine. When the snow melted true starvation began. People had swollen faces and legs and stomachs. They could not contain their urine...And now they ate anything at all. They caught mice, rats, sparrows, ants, earthworms. They ground up bones into flour, and did the same thing with leather and shoe soles; they cut up old skins and furs to make noodles of a kind and they cooked glue. And when the grass came up, they began to dig up the roots and ate the leaves and the buds, they used everything there was; dandelions, and burdocks and bluebells and willowroot, and sedums and nettles . . .
". . . the fertile Ukrainian soil was covered with human corpses . . . I saw how special brigades gathered the corpses from the streets and houses, and carted them to common graves, or simply threw them in ravines." This map shows the rate of population decline in some regions of the USSR during the period from 1929-1933. The area around Saratov in the upper right hand corner of the map (which includes Norka) shows a decline of 15 to 19.9 percent. Ukraine suffered rates of decline above 20 percent. Source: Wikimedia Commons. The Italian Consul in Kharkov, the capital of Ukraine, reported that there was: "a growing commerce in human meat" and that people in the countryside were killing and eating their own children. The authorities responded by distributing posters that read: 'EATING DEAD CHILDREN IS BARBARISM.' People knew that there was food in the cities and desperately tried to flee the countryside. In Kharkov in 1932, the police recovered 250 corpses every morning from the railway station. Many letters were written between friends and family living in Norka and North America describing the difficult situation. Some of the letters were published in Die Welt-Post. Despite the massive scale of the famine, a deliberate conspiracy of silence was enforced and doctors were forbidden to disclose on death certificates that the deceased had starved to death. Figures on the number of people who died during the famine in Ukraine are difficult to determine accurately. Estimates vary between 5 and 8 million equivalent to 10 to 25 per cent of the entire population of the Ukraine. The famine which struck the Soviet Union in the winter of 1932-33 was unlike 1921 and appears to have been instigated by Stalin whose main goal was to force farmers into collectivization. 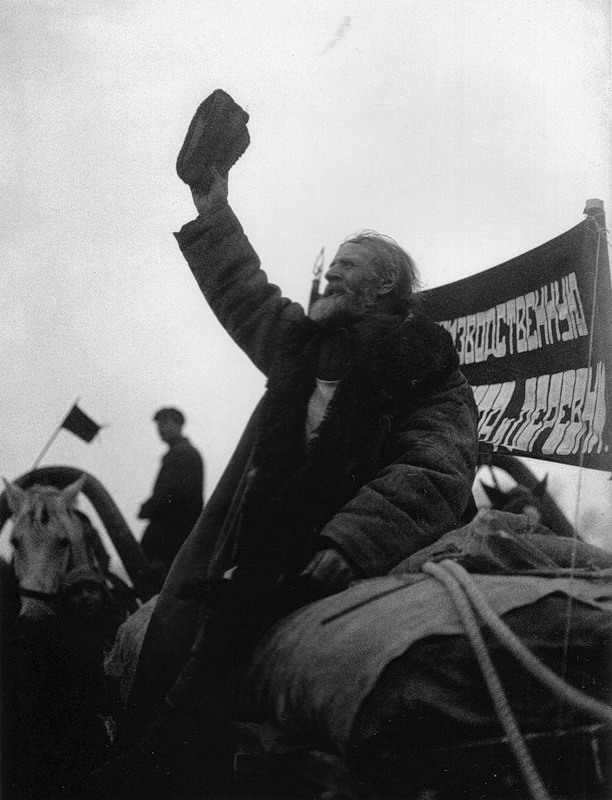 It is estimated that between 2 and 7 million people died from this man-made famine in Russia. The famines of the 1920's and 1930's took a very heavy toll on the people of Norka, but Stalin's terror would forever change the way of life for the Volga Germans in 1941. Watson, Fiona. "One Hundred Years of Famine – A Pause for Reflection." Field Exchange 8 (1999): 19. ENN. Web. 23 Sept. 2016. <http://www.ennonline.net/fex/8/one>. Kean, Sam. "The Soviet Era's Deadliest Scientist Is Regaining Popularity in Russia​." The Atlantic. 19 Dec 2017. Online edition.